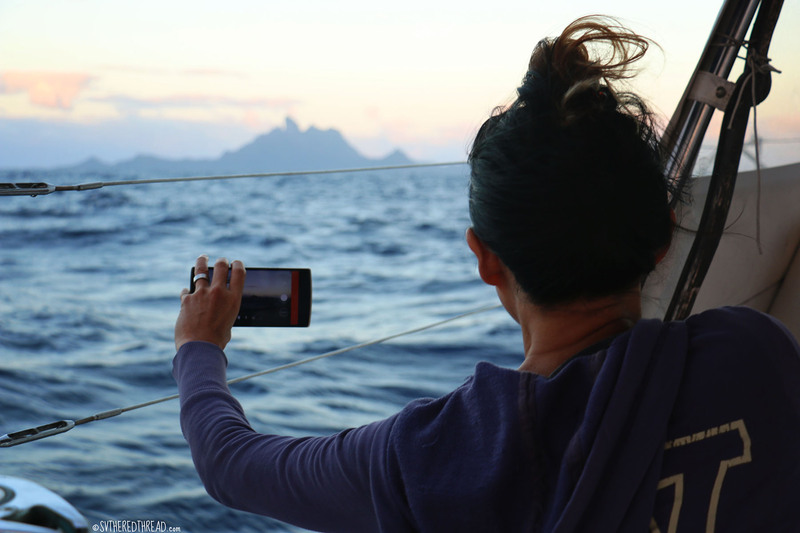 For us, Moorea will forever be the juncture at which our path less traveled converged with the route well-trodden by cruisers and where Mark and Helen joined us to celebrate at the Tahiti-Moorea Rendezvous. It will also be the place where we first learned what a stingray feels like to the touch and the embarkation point for Mark and Helen’s first [and possibly last] overnight passage. 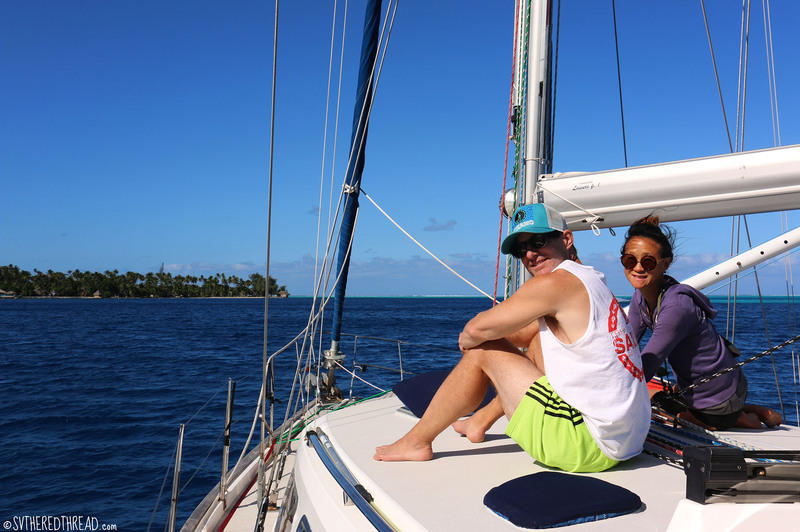 With the exception of a single overnight passage from Mazatlan to Isla Isabela in Mexico with Neil’s mom and the passage from Panama to the Galápagos with Lori, all of our overnight sails have been just the two of us. Overnights are a unique experience, and we were excited to share one with Mark and Helen. 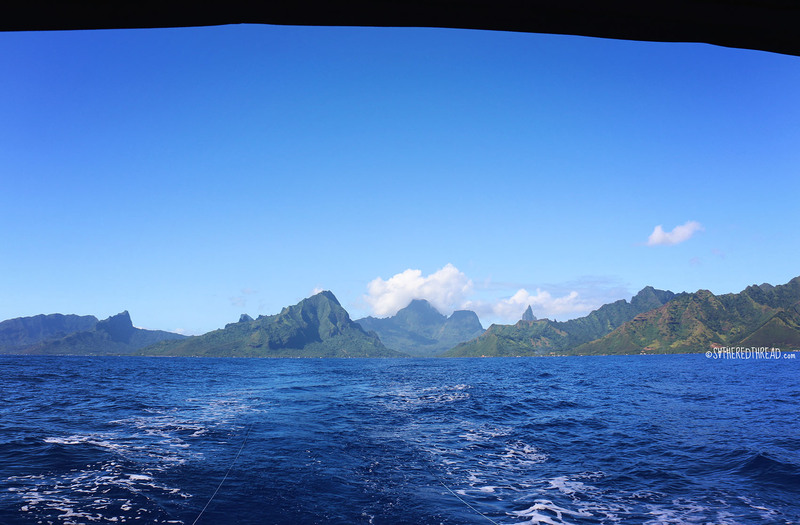 We enjoyed a blue-sky departure but exited Moorea’s protective reef to find a meager 3 knots of breeze and rolly seas. The forecast had promised 15 knots of winds, but at 10 o’clock in the morning, it was clearly not so. Aiming for a morning landfall in Bora Bora, however, we kept on, hopeful that the winds would fill in as the day heated up. The seas were bumpy for the first few hours, as ole iron sail (aka the engine) roared. Boats under sail move rhythmically with the seas and wind; under motor, boats struggle unnaturally. We were relieved that the tummies of our landlubbing friends’ were tolerating the not-so-comfortable ride! As the breeze perked a bit, we tried a few sail configurations to steady the boat. The seas were too large to comfortably sail wing-on-wing, and we eventually settled on turning slightly closer to the wind, expecting that the breeze would continue to perk, enabling us to turn a bit deeper later in the day. By mid-afternoon, the winds picked up. Fourteen to 19 knots over our aft port quarter had us trucking downwind at 5.8 knots, as 2-meter swell chased our stern in short sets. Moorea grew smaller in the distance, as the sun cascaded beyond the horizon of the great Pacific, an infinity pool whose edge was boundless. 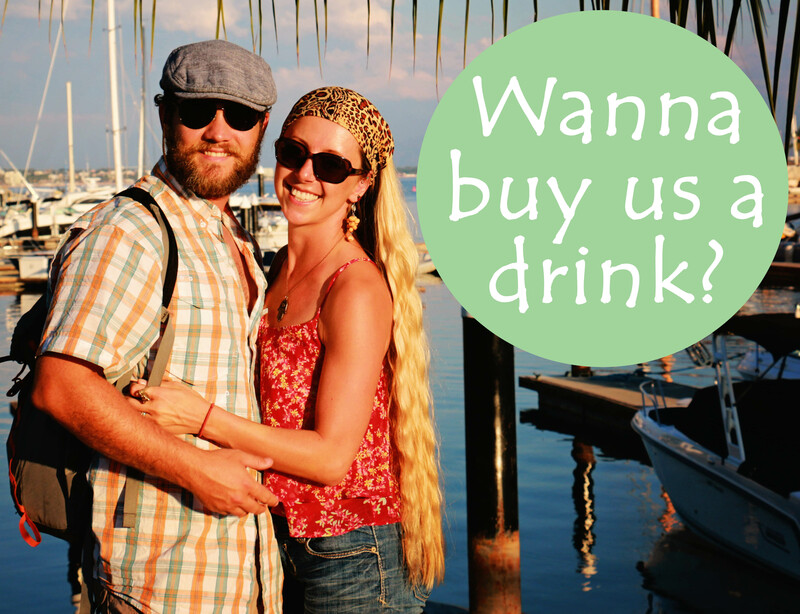 We shared dinner, and Mark and Helen enjoyed a sunset cocktail; we abstained, staying true to one of our rules on passage. Alcohol tends to exacerbate queasiness for me anyway. Our friends had initially suggested they would share our watches, but they grew drowsy as dusk settled and the forceful but monotonous churn of the waves did not abate. Sometimes tiredness is a sign of mild seasickness, and I wondered if they might be experiencing subtle symptoms. Night fell, and Neil greeted the darkness alone for his watch, his three crew members having retired for some time in the bunk. The moon wasn’t expected to join him for a number of hours. Neil woke me around 2 am, and I settled in, cognizant that for the first time in many a night watch, I’d need to be especially mindful of nearby islands and boat traffic. I worried a bit that the remoteness of our night passages during the months prior (i.e., Galápagos to Rapa Nui [Easter Island], Rapa Nui to the Gambiers, Gambiers to Raivavae, and Raivavae to Tahiti) might have made my watch practices a bit slipshod. Perhaps expectedly, I felt anxious when I spied lights on the horizon. The vessel was slower than a container ship or a cruise liner and glittered like a palace. I adjusted our course as much as I could but wasn’t satisfied with the angle. I awoke Neil, and we jibed to achieve a safer course. The centering of the mast, tugging of lines, and winching of sheets echo through the hull of Red Thread. Our guests awoke to investigate the commotion and see the humongous three-masted cruising ship passing us to port. Everyone retired back to bed, save me. 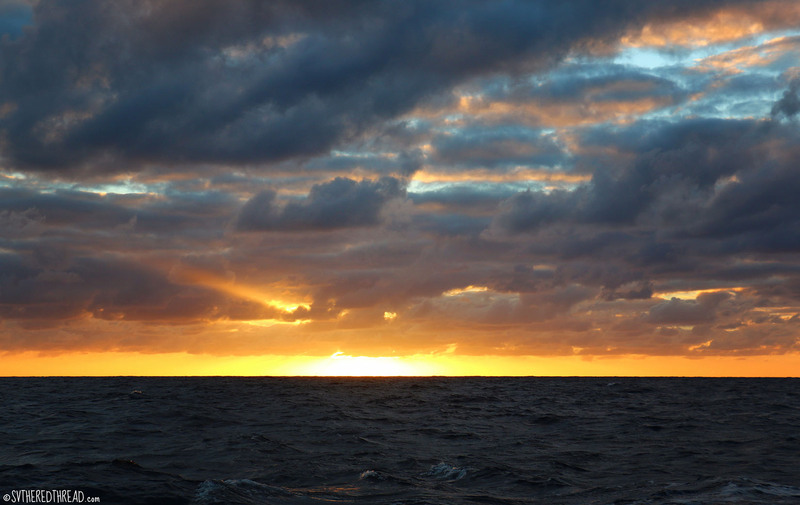 We sailed north o’er Huahine, Tahaa, and Raiatea, and I greeted the first vestiges of light with gratitude—the gift of light to help me maintain alertness for the final few hours of my watch. As dawn neared, Mark joined me, then Helen. She would later remark that she was glad she’d had the experience of an overnight sail but that she did not need to do it again, a reminder that this lifestyle is certainly not for all. A blanket of lavender and rose draped the island. 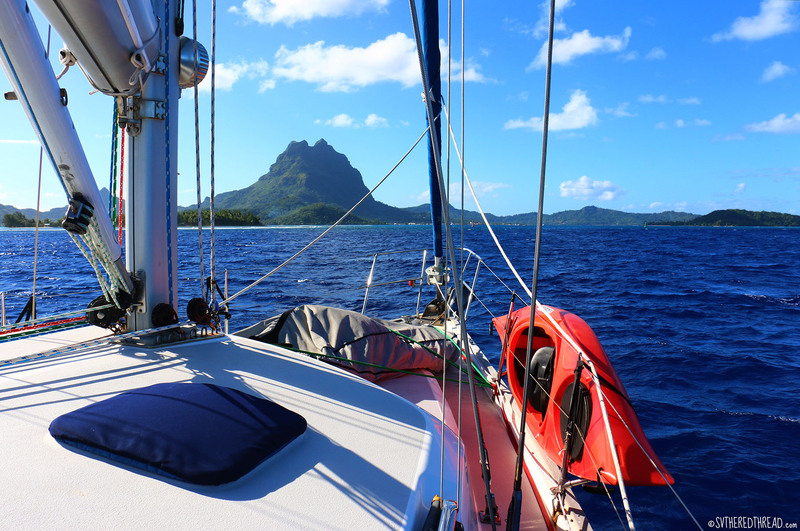 In the lee of famous Bora Bora, the seas relaxed. As the sun climbed, navy and slate seas brightened to cheerful blue. 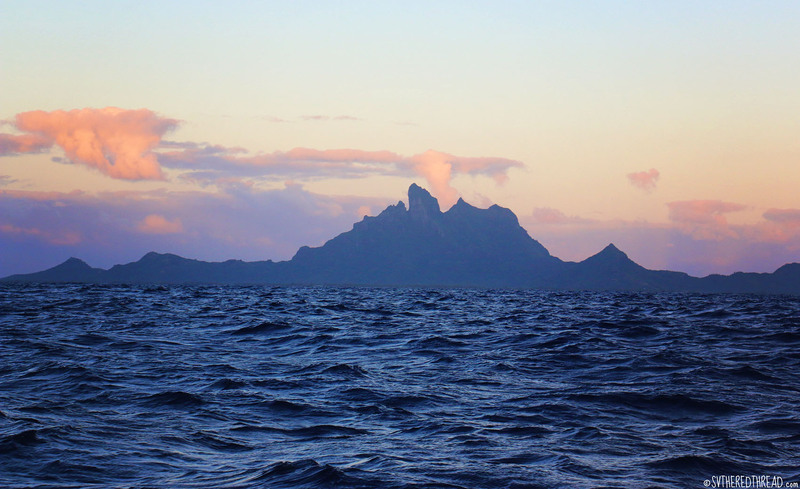 We entered the reef pass, and Neil and I smiled at each other as Mark and Helen climbed atop the cabin, and our crew greeted a third island in French Polynesia’s Society group. Jessie’s musings: The passage was somewhat bumpy but not particularly memorable in and of itself. Yet having guests aboard for an overnight passage triggered memories of my early overnight passages, of the way very natural sounds of a sailing boat felt eerie—even scary sometimes—and used to quicken my heartbeat as I lay in darkness, wondering if things were okay on deck. I found myself feeling protective of Mark and Helen; being responsible and safe felt even more important with them aboard. I pondered how I might feel when we have children aboard someday. This entry was posted in By Jessie, French Polynesia, Friends and loved ones, Passages, Society Islands, South Pacific and tagged Bora Bora. Bookmark the permalink. Jesse, as always your writing is superb, i am there with you, all the way! Thank you for your kind words about my writing, i will keep it up, now i am exited again! Hugs!! !